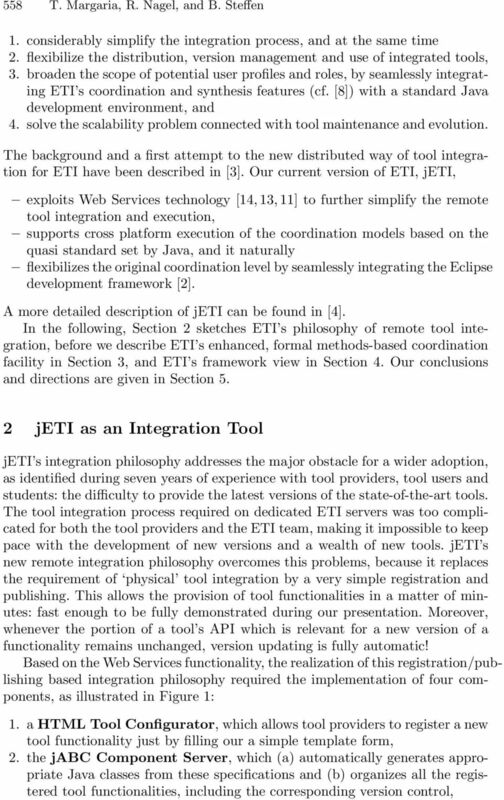 Download "jeti: A Tool for Remote Tool Integration"
3 jeti: A Tool for Remote Tool Integration 559 Fig. 1. 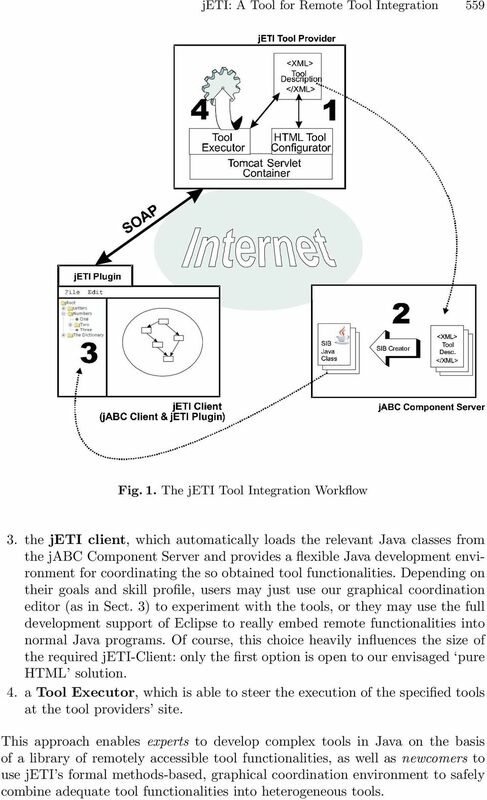 The jeti Tool Integration Workflow 3. the jeti client, which automatically loads the relevant Java classes from the jabc Component Server and provides a flexible Java development environment for coordinating the so obtained tool functionalities. Depending on their goals and skill profile, users may just use our graphical coordination editor (as in Sect. 3) to experiment with the tools, or they may use the full development support of Eclipse to really embed remote functionalities into normal Java programs. Of course, this choice heavily influences the size of the required jeti-client: only the first option is open to our envisaged pure HTML solution. 4. a Tool Executor, which is able to steer the execution of the specified tools at the tool providers site. 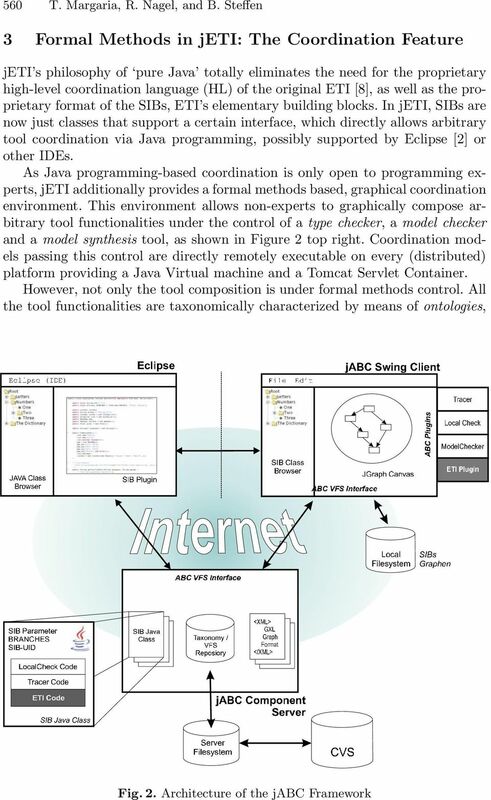 This approach enables experts to develop complex tools in Java on the basis of a library of remotely accessible tool functionalities, as well as newcomers to use jeti s formal methods-based, graphical coordination environment to safely combine adequate tool functionalities into heterogeneous tools. 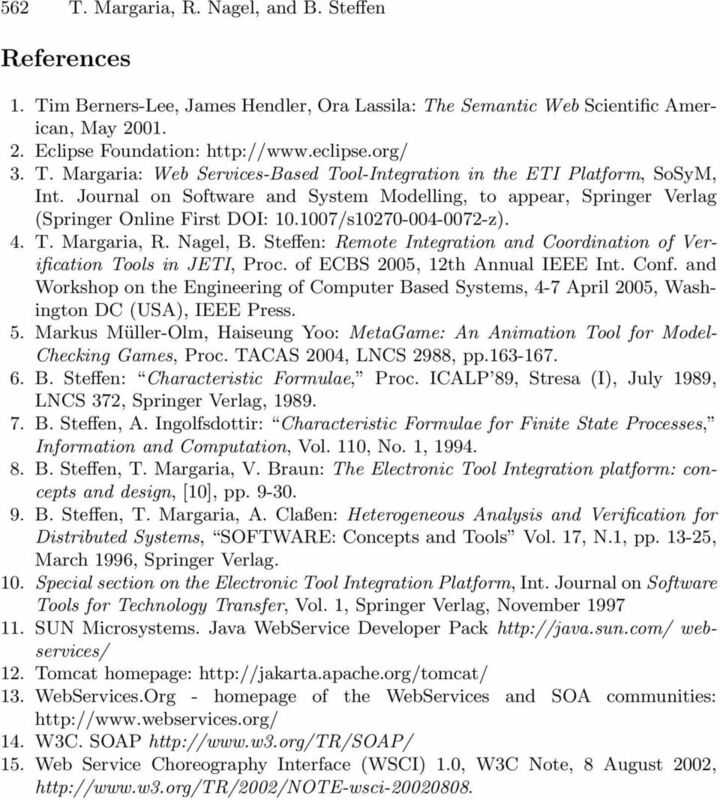 5 jeti: A Tool for Remote Tool Integration 561 similar to the techniques adopted for the Semantic Web . ETI supports a global classification, but users may also introduce their private classification scheme, which helps them to quickly identify the tools relevant for certain applications. In fact, the requirement for this organizational support of tool functionalities was a result of a common project with the CMU, aiming at introducing a larger variety of formal verification tools in the undergraduate curricula. 4 jeti: The Architecture jeti can be seen as a tool that enhances other tools and frameworks by the integration, organization and execution of remote functionalities. E.g., the setup described above is based on jabc (cf. Figure 2), which is itself a framework for enhancing Java development environments (like Eclipse) with a graphical coordination level and dedicated control via formal methods. The charme of this architecture is that complex environment functionality can be added just via the plugin concept: this allows users to combine/exchange functionality in a transparent way, without touching the code of the kernel system. In our case, jabc can itself be seen as an Eclipse plugin, which, in addition to the ETI plugin, offers plugins for model checking, local checking, and a tracer. 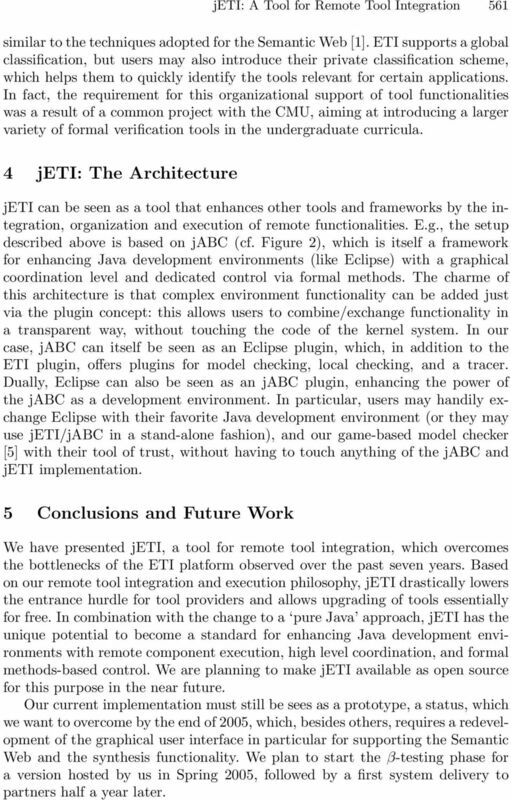 Dually, Eclipse can also be seen as an jabc plugin, enhancing the power of the jabc as a development environment. In particular, users may handily exchange Eclipse with their favorite Java development environment (or they may use jeti/jabc in a stand-alone fashion), and our game-based model checker  with their tool of trust, without having to touch anything of the jabc and jeti implementation. 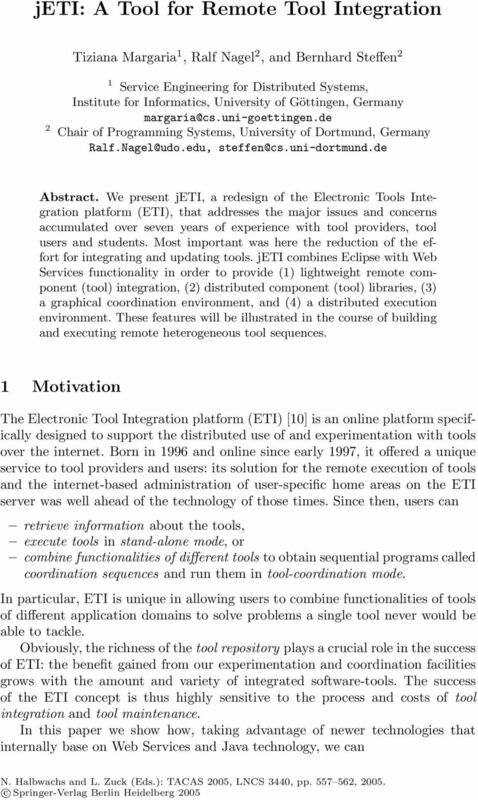 5 Conclusions and Future Work We have presented jeti, a tool for remote tool integration, which overcomes the bottlenecks of the ETI platform observed over the past seven years. Based on our remote tool integration and execution philosophy, jeti drastically lowers the entrance hurdle for tool providers and allows upgrading of tools essentially for free. In combination with the change to a pure Java approach, jeti has the unique potential to become a standard for enhancing Java development environments with remote component execution, high level coordination, and formal methods-based control. We are planning to make jeti available as open source for this purpose in the near future. Our current implementation must still be sees as a prototype, a status, which we want to overcome by the end of 2005, which, besides others, requires a redevelopment of the graphical user interface in particular for supporting the Semantic Web and the synthesis functionality. We plan to start the β-testing phase for a version hosted by us in Spring 2005, followed by a first system delivery to partners half a year later. Peer-to-Peer Issue Tracking System: Challenges and Solutions Vijay Srinivas Agneeswaran, Rammohan Narendula and Karl Aberer Distributed Information Systems Lab (LSIR) Ecole Polytechnique Fédérale de Lausanne. Building a Modular Server Platform with OSGi. Dileepa Jayakody Software Engineer SSWSO2 Inc.